Ten years after his arrival in Goshenhoppen, Father Theodore Schneider came to Reading in 1752. The few Catholics who settled in Reading shortly after its founding received ministrations from the priests from Goshenhoppen who came on horseback at regular intervals to serve their spiritual needs. Jesuit Fathers Schneider and Farmer served the Catholics in the town. 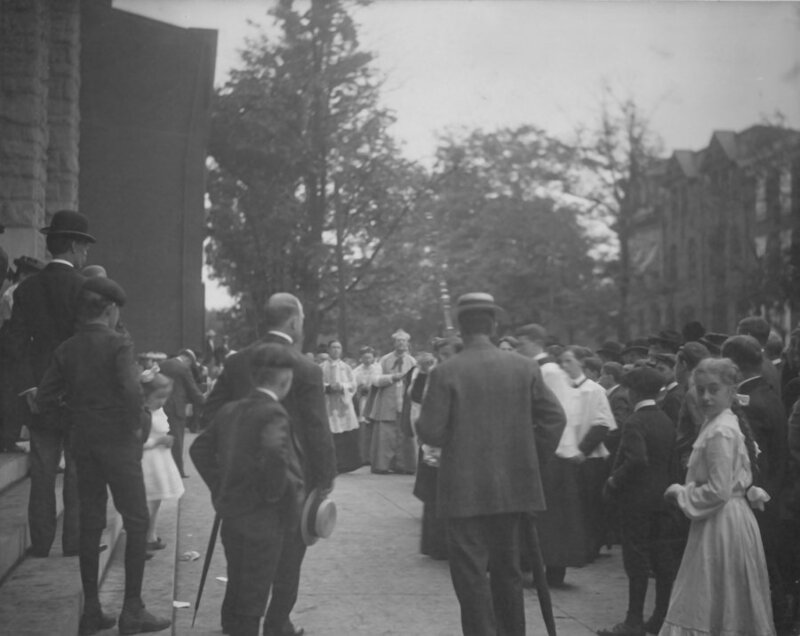 The missionaries came regularly and the church grew slowly but surely. The first “meeting house” was a log cabin where Mass was said and where the first chapel was built on the East side of Duke Street (now 7th Street) prior to 1756. About 1790, the old building was demolished and the cornerstone for a small brick church was laid on August 17, 1791. Jesuit missionaries continued to come at regular intervals. In 1818, Saint Peter the Apostle Church was incorporated and became an independent parish. Father George Schoenfelder was appointed as the first resident pastor. For a quarter of a century, the parish grew and prospered. By 1844, the congregation had outgrown the little church and a lot was purchased at 326 South Fifth Street. 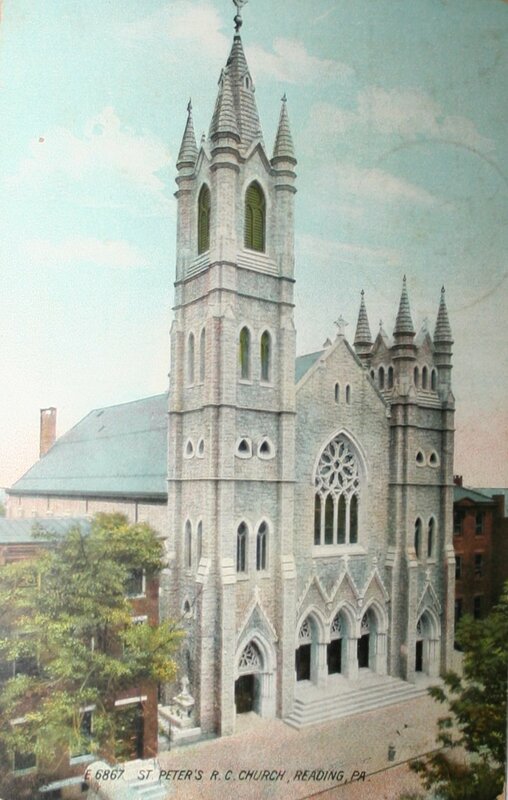 A brick church was erected and dedicated on May 24, 1846. Because of the scarcity of priests or difficulty with the board of trustees, Saint Peter’s Parish was left without a pastor at times. During these times, Father Augustine Bally came to Reading to celebrate Mass. Bishop John Neumann of Philadelphia was personally interested in establishing a parochial school for the parish. He purchased a property at 225-227 South Fifth Street for that purpose and proposed to the Sisters, Servants of the Immaculate Heart of Mary from Monroe, Michigan, that they come to Reading and staff the parish school. This request was accepted and the development of a parish school was completed with their arrival in July 1859. On September 2, 1859, Bishop Neumann celebrated the first Mass in the chapel and blessed the building. A Select School for Girls was opened on September 5, 1859; later on September 12th, a School for Boys was opened in the basement of the Church. St. Peter’s Church, as it stands today, is largely due to the untiring efforts of a man whose remains now rest beneath the church’s south tower. This man was Father James E. Cleary, pastor from 1889 until his death in 1904. 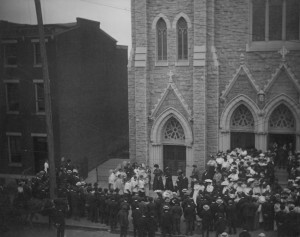 The work of rebuilding the church was begun by Father Cleary in 1900. The church was completely rebuilt and refurbished by 1905. Only the brick walls of the old church were left standing and served as the backing for the outer walls of granite. The congregation dedicated the main altar to Father Cleary’s memory. 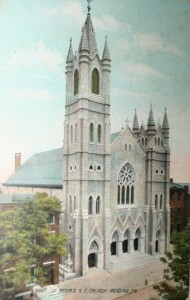 Saint Peter’s Church was dedicated by Archbishop James Cardinal Gibbons of Baltimore on July 2, 1905. Saint Peter the Apostle Parish celebrated its 250th anniversary in 2002. Father Charles Marciano served as pastor until his death in 2003. The rectory was renamed the Parish House in December 2008. 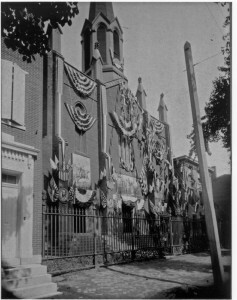 It contains Saint Anthony Chapel named such to honor the Lithuanian parish located at 8th and Bingaman Streets which was consolidated with Saint Peter Parish in 2004. St. Peter School celebrated its 150th anniversary on April 25, 2009. Monsignor Thomas J. Orsulak has served as pastor since 2005.